He notes the feature packs will likely have a profound impact on the industrial IoT space, where a lot of the front-facing parts of a factory, for example, are directly tied to the data centre. 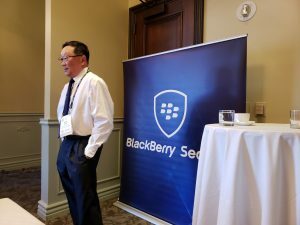 BlackBerry’s IoT announcement focuses on the business market, meaning other vendors should be stepping up to the plate to cover areas that BlackBerry won’t get to right away, said Sangster, adding the government should also take a hard look at the IoT space and develop a set of standards that emphasize built-in security because of the technology’s rapid insertion into everyday life. Chen also said the rise of 5G will have a profound impact on BlackBerry’s work in the autonomous vehicle market. BlackBerry announced the QNX platform for digital cockpits at CES 2019, meaning automakers can offer a reliable and secure QNX-based digital instrument and infotainment system that provides access to the latest Android-based applications such as Google Maps and Google Play from a single engine control unit.